GEORGE TOWN: The RM1.1bil Penang International City, located on a 100-acre site in Bayan Lepas, will be the most expensive and largest project unveiled on the island this year when it is launched in October, said Ideal Property Development Sdn Bhd managing director Datuk Alex Ooi. Ideal Property is developing the project through a joint venture with Koperasi Tunas Muda. It comprises some 1,800 landed residential and high-rise properties, which make up 80% of the project, with commercial properties taking up the rest, according to Ooi. “Our strategy is to first launch the residential components, strengthen the infrastructure, and then move on to the commercial phase, comprising a four-star hotel, a 250,000 sq ft lifestyle shopping mall, and a 150,000 sq ft resort office building, equipped with recreational facilities, besides modern IT infrastructure,” he said. Subsequently residential high-rise properties, comprising over 1,000 condominium units will be launched while “sometime in late 2010 or early 2011, the commercial components will be launched,” he added. Ooi said the landed properties would be priced between RM550,000 and RM780,000, while the apartments between RM300,000 and RM500,000, adding that a 12-acre site would be allocated for the development of an education institution. “We will also create a one-acre man-made lake as part of the project,” he said. The project would be marketed in Hong Kong, Singapore, Indonesia, and other parts of Asia, Ooi said. “We are confident as the property market in China has rebounded, which will have a positive impact on the regional market,” he said. The recent brisk sales of the One World and One Sky high-rise projects in Bayan Baru showed very strong demand for residential properties on the island, Ooi said. “The One World and One Sky high-rise properties by Ideal Property and Kuwait Finance House were respectively sold out after their launches in May and July. “Both projects have over 500 condominium units, priced between RM235,000 and RM410,000,” he said. Ooi said Ideal Property was also exploring to launch other projects with Koperasi Tunas Mudas, which owns other strategically located sites in the southwest district of the island. “We are considering the development of modern office buildings next year,” he said. Ideal Property is part of the Penang-based Ideal Group, comprising over 20 companies, involved in property development, property investment holding and business process outsourcing. In property development, the group has since 2002 developed over 600 units of landed and residential high-rise properties in Penang and Kuala Lumpur. The group currently owns and manages three properties on the island, including the landmark Northern Tower at Jalan Sultan Ahmad Shah (or the millionaires’ row) and a light industrial park in Kepong. Besides Penang, the group also has property investment businesses in Cambodia, Shanghai and Beijing in China. Property developer Glomac Bhd is selling one of its two corporate towers at its upmarket RM800 million Glomac Damansara development in Petaling Jaya to a government agency for RM200 million. Its executive vice-chairman Datuk Richard Fong Loong Tuck said the deal is due to be finalised by month-end. Glomac Damansara consists of a 15- and 30-storey corporate tower, two 25-storey serviced apartment blocks, five- and eight-storey shop offices, nine- and 11-storey office suites and a hybrid retail mall. Fong told Business Times the government agency will buy the 30-storey corporate tower but it wants the height reduced by five floors. "We are in negotiations with the agency and will plan the design of the building according to their request. Since we are reducing the height of the tower, we will raise the floors for the other buildings," Fong said. Fong said the office suites, which will be launched in mid-2010, may be increased by two floors, increasing its value from RM120 million currently. Fong said other investors have approached Glomac for the 15-storey tower, which is valued at RM60 million and earmarked as its new headquarters. He added that negotiations are ongoing with some of the parties. "We will launch and hope to sell the corporate tower, shop offices and office suites before introducing the serviced apartments and mall next year. There is demand for office space in this area," Fong said. Glomac has sold 70 per cent of the five- and eight-storey shop offices, launched in March this year. Fong said sales of the shop offices were slow initially but picked up from late May. As for the apartment blocks, Glomac is mulling to launch the units in early 2010, targeting locals within Petaling Jaya, Taman Tun Dr Ismail, Bandar Utama, Damansara and Bangsar, Fong said. Fong said the price of the apartments have been pegged at RM600 per sq ft and above. "When we first planned the apartments, we were looking to have 208 units, each with a built-up of 1,500 sq ft. However, we have reduced the sizes to 800 sq ft to 1,500 sq ft so we are now offering 300 units for sale to the man on the street," Fong said. "We are not targeting en bloc buyers as there are not that many around. Previously, there were a lot of buyers from the Middle East but they have become very cautious and are cash-strapped as a result of the financial meltdown," Fong said. Fong said Glomac will start construction on the mall, which is worth RM150 million, by the end of 2010. 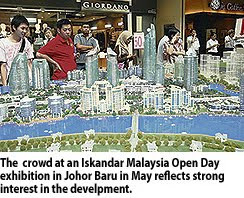 Iskandar Malaysia in Johor is likely to recover from the economic slowdown much faster than other parts of the country. Despite the downturn, foundation infrastructure work has begun, and there is clear political will to make the economic corridor a success, a senior valuer said. Chartered valuation surveyor Samuel Tan said Iskandar Malaysia's proximity to Singapore and the multi-million-ringgit allocation from the federal government are also factors which will help Johor pick itself up better than others. "A lot of overseas interest was generated when Iskandar Malaysia was launched in 2006. Johor Baru, which had been in a property slump for the past decade, is now seen as a place with good investment potential. "Malaysians are sceptical (of Iskandar Malaysia's success) because of how the past years went, but I would remind them that it's a 25-year plan. Things will not change overnight," he said. Tan, who is also executive director of KGV-Lambert Smith Hampton in Johor Baru, added that a statutory body like the Iskandar Regional Development Authority (Irda) also helps to convince foreign investors of the groundwork which the government has set up. And while much still needs to be done on projects such as EduCity and the Newcastle University of Medicine Malaysia, important foundation work has begun. "I can give examples of the Eastern Dispersal Link, Jalan Yahya Awal interchange, Southern Link and Senai-Desaru Expressway - all these facilitate traffic flow. "I believe that by the time these roads are ready, Johor Baru will have recovered from the slump and be ready to move forward." Tan was cautious when asked to comment on reports of soaring property prices, following the Iskandar Malaysia development. "It's true that following extensive promotion, Iskandar Malaysia captured a lot of foreign interest and things started looking up. "Unfortunately, the present slowdown set in soon after that. So recovery has been derailed a bit." House prices in Johor fell nearly 25 per cent following the 1997-98 economic crisis. A two-storey house in Perling, Johor Baru, which sold for RM280,000 in 1997 will fetch about RM180,000 today. Tan said although this trend was likely to continue next year, there could be some light at the end of the tunnel next year. "For instance, about four years ago, a company bought 12ha of commercial land at RM30psf for a large department store in Johor Baru. More recently, they bought another plot of land but this time at RM65psf. "Even in these uncertain times this company was willing to pay twice the price for this new piece of land. This is a sign that we're slowly moving towards better times, most probably in 2011 or 2012." The next two years, Tan said, will be a time for Iskandar Malaysia to build up its foundation and strengthen ties with new and prospective investors. He suggested that Iskandar Malaysia stop depending on foreign investments for the next couple of years. "I've heard local investors claim that they're not given a level playing field. For the next two years, make it easier for local investors to set up in Iskandar Malaysia. Why not offer incentives for local companies to come in. "The reason I'm suggesting this is because foreign investors first need to get their own house in order before they can invest overseas whereas Iskandar Malaysia cannot wait, it has to continue. "And in the meantime, where else do we get investors from, but from our own shores," he said. Despite the uncertainties surrounding the current business climate, Tan was hopeful about the property market in Johor. "We're at the stage of building a foundation for Iskandar Malaysia, which is made easier with the close collaboration of the federal and state governments and the private sector. "With that in mind, we can work towards recovery, which I believe we can expect to see in 2012," he said. Malaysia Land Properties Sdn Bhd (Mayland), a privately held property developer controlled by Tan Sri David Chiu, could add a new mall under its wings by as early as next year. Mayland, which owns and manages the RM50 million Hartamas Shopping Centre, sees the operation of shopping complexes as an ideal avenue for recurring income. "We are looking at expanding our recurring income division mainly by doing more retail. We believe in the Malaysian market," said its director Winnie Chiu. "There will be something coming up soon within the Klang Valley. We expect to finalise the details by year-end," she told Business Times in an interview. Chiu added that Mayland would consider other locations for a mall if it meets the group's criteria. Mayland's keenness to expand the retail mall segment of its business is partly due to the double-digit revenue growth notched by its maiden 300,000 sq ft Hartamas Shopping Centre in Kuala Lumpur. The mall, which forms part of the integrated Plaza Damas project, provided a return on investment within three-and-a-half years. In the first three years, it grew at an average of 10 per cent year-on-year. "Hartamas Shopping Centre has a proven track record. Our revenue has grown 35 per cent this year," she said. This year's handsome growth numbers are the result of an additional 20,000 sq ft of space, a rental increase following tenancy renewals as well as a better tenant mix. Tweaking its tenant mix coupled with the opening of Taylor's College a year ago has seen average patronage to the mall increase to 8,500 a day from a daily average of 6,000 last year. "A 20 per cent increase in revenue next year is possible," Chiu said, when asked about the outlook for 2010. She said this will be made possible by the creation of additional space through the reduction in space wastage. The improving economy will further lend support to improved revenue. The mall has a total of 138 outlets and 35 per cent of its tenants are in the food and beverage business. Its best performing tenant is Japanese restaurant Rakuzen. PETALING JAYA: Malaysia, which has 11 listed real estate investment trusts (REITs) and two property trusts, can accommodate more listed REITs to add further depth, liquidity and asset choices to the stock market. Currently, REIT transactions account for only 11% of market capitalisation in the country compared with 52.1% in North America. According to the latest Asian Public Real Estate Association’s weekly REIT report, Asia’s REIT industry has a market capitalisation of US$58.86bil, with Japan taking the lead with US$30.5bil. Malaysia’s US$1.43bil in market capitalisation is behind the rest of the pack, including Singapore (US$15.1bil), Hong Kong (US$8.3bil), Taiwan (US$1.53bil) and Thailand (US$1.52bil). Come next year, if Sunway City Bhd goes ahead with its proposed listing of its RM3.7bil REIT on the local bourse, it will be the industry’s largest. Also in the pipeline is CapitaLand Ltd’s retail REIT, which will be the first foreign-sponsored REIT on Bursa Malaysia. Axis REIT Managers Bhd chief executive officer and executive director Stewart Labrooy said shareholders’ current expectations of high dividend yields would not be conducive for new REIT listings. “The average prevailing yields of 8% to 10% are considered high. When the market stabilises and the unit price of REIT goes up, yields should come back down again to around 7% to 8%. When that happens, it will be a better time for new REITs to be listed,” he said. Although the market environment has turned more positive following the Government’s liberalisation measures, Labrooy said there was a need to create a more attractive tax regime for REIT investors in relation to withholding tax. “We would like to see distributions for Malaysian REITs not to be taxed to promote greater retail participation. A higher retail investor participation in the market will create a higher liquidity and trade volume,” he said. He lauded the Securities Commission (SC) for doing a great job in supporting the local REIT industry by constantly engaging with industry players for feedback and acting on them. “There was a complete revamp of the REITs guidelines last August. The SC has been very innovative and was the first to come out with Islamic REIT guidelines,” Labrooy said. He said there was potential for new sectors to be introduced including toll-roads, airports, serviced apartments, university accommodation and even prisons. In terms of total returns over the past one year, Labrooy said five Malaysian REITs (M REITs) emerged among the top 10 performing REITs in Asia. 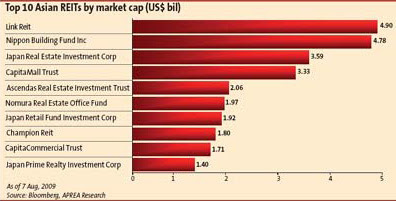 They were Al-Hadharah Boustead REIT, UOA REIT, Al-Aqar KPJ REIT, Axis REIT and AmFirst REIT. The total returns (comprising the share value plus dividend yields) for these top performing REITs ranged from 17% to 30%. Although the worst may be over for M REITs as most of their unit prices have recovered to match their net asset value (NAV), there are still some challenges that need to be addressed by industry players. “There is a need to move short-term debt into medium to long-term debt to match the leasing period and remove uncertainties of volatile interest rates. At the end of the day, it is better for industry players to opt for longer term debts and a good ratio will be 60:40 of long term to short-term debts,” he added. There is also a need for a higher retail investor participation in the REIT market as currently the market liquidity is still low. This can be addressed by expanding portfolios and market capitalisation of each of the listed funds. Labrooy said following the improvement in the market, Axis REIT has recently got back on its asset acquisition trail with the latest addition of a RM65mil logistics centre in Port Klang. At the same time it is also planning a placement of 51.18 million new units into the market which will provide the funding for the purchase of an additional RM120mil of new assets which have already been identified. “Our intended goal of achieving RM1bil in assets under management was delayed by the crisis last year but we are back on track and will continue to execute our strategy for the benefit of our unitholders,” he said. As at June 30, Axis REIT has 19 properties under its stable with assets under management worth about RM728mil and approved fund size of 255.9 million units. Have we bounced off the bottom of the property cycle? It was barely a year ago that property prices were plummeting. Since then, the world’s central banks have flooded the markets with an unprecedented liquidity tsunami that has lifted prices of assets like stocks and property. Liquidity comes in many forms, the most evident and tangible is lower interest rates, which immediately lower mortgage costs and allow potential borrowers to borrow more with the same level of disposable income. It also reduces the returns on deposits which make it more attractive for depositors to redeploy their funds into higher yielding and more speculative assets like shares and property. Other forms of less tangible liquidity measures involve providing cheap funding for banks and printing money. In China, the liquidity came in the form of generous lending by state-owned banks which boosted lending in the first half of 2009 by 7.37 trillion yuan (RM3.8 trillion) – 2.3 times the amount of loans issued during the same period last year. Some would argue that policymakers are creating a bigger bubble to counter the effects of the one that just burst. It was the bursting of the property and debt bubble in the United States that precipitated the global financial crisis. The global liquidity tsunami appears to have succeeded in arresting the fall in global property prices. The mother of all property indices, the Case Shiller Composite 20 Home Index – which measures property prices in 20 US metropolitan cities – saw its first month-on-month rise in May 2009 after falling 33% from a peak in July 2006. The peaking of US house prices was followed by the global financial crisis two years later, so hopefully a bottoming of US house prices is a lead indicator of better economic times. Home prices in the United States are less overvalued after the price correction but are not particularly cheap as they have risen more than the inflation. Nevertheless, the affordability of the homes has improved as interest rates have declined. The stabilisation of the US housing market is crucial as it means household wealth will also stabilise. Higher household wealth, closely tied to property and stock prices, will boost consumer sentiment. This in turn could boost US consumer spending and, hence, Asian exports. It would also boost the US economy as consumer spending accounts for 70% of the US economy. However, it would appear that any recovery is likely to be muted as unemployment remains high and households are still deleveraging from high debt levels. Ironically, a weak recovery and the deflationary effects of excess capacity will allow policymakers to keep interest rates low for a long time. After all, policymakers are unlikely to want to raise interest rates prematurely and be blamed for tipping the economy back into recession. Property prices and transactions in Asian countries like China, Hong Kong, Singapore, Taiwan and South Korea have risen from depressed levels in the first quarter of 2009. In fact, the prices for the Housing Development Board (HBD) units, in which the majority of Singaporeans live, are at an all-time high. Low mortgage rates of less than 2% in Singapore have helped boost property prices. This is good news for property owners but bad news if you are a new graduate aspiring to own a property. In Malaysia, lower interest rates, a buoyant stock market and better consumer sentiment have combined to boost demand for properties. Bargain hunters queued for properties launched by Island & Peninsular in Bandar Kinrara and Glenmarie and IJM Land in Jelutong, Penang. Property companies are generally seeing better demand for property, and property agents are seeing renewed interest from home buyers. Ironically, the rental market is not improving due to the ample supply of new property at a time when economic activity remains weak. The new supply of high-end condominiums and office space in KL is arising at a time when some multinational companies are downsizing. Higher supply and weak demand are likely to translate into lower rentals but not necessarily lower property prices as the alternative is to invest in deposits yielding only 2%. This phenomenon has been observed in many countries like Hong Kong, Singapore and Taiwan where rental yields are at only 2% as deposit rates in those countries are at 1% or less. In the end, the effect of this liquidity is to punish the savers and reward borrowers with high risk-taking behaviour. Nothing much has changed despite all the touted reforms and we are on the way to creating a new bubble which would hopefully compensate for the current downturn before it eventually bursts. In the meantime, property prices and property stocks are likely to rise in the liquidity-induced asset price inflation. The prices of property stocks have risen sharply from their lows in March 2009. The larger property stocks in Malaysia and the region are priced more than one times book. Many smaller property stocks are still trading at below one times book and offer more attractive valuations. The party is on, the participants are intoxicated with liquidity but when the music stops, make sure you are not the player caught without a chair in a game of musical chairs. Having made its presence felt in eight countries, Holiday Villa Hotels & Resorts, one of the leading hotel chains in Malaysia, expects to open two more properties in Cambodia and China by the end of the year. In a statement made available to Business Times, Holiday Villa, a member the public-listed Advance Synergy group, said two more properties were in the pipeline, namely in Sihanoukville, Cambodia, and Kaifeng in Henan, China. Holiday Villa opened its door to guests in Doha, Qatar, with the soft launch of the Holiday Villa Hotel and Residence City Centre on July 20. With the launch, Holiday Villa now operates 18 quality hotels and resorts with a total of 4,000 rooms and suites. Besides Malaysia and Qatar, Holiday Villa Hotels and Resorts are located in the UK, Indonesia, Australia, Sudan, Cambodia, Vietnam and China. Early this year, the hotel group expanded to Halong Bay in Vietnam and Shenzhen in China. On its property in Doha, Holiday Villa said the hotel is strategically located at Al-Muntazah Signal, opposite the Muntazah Park. DUBAI: Just one year ago, property prices in Dubai were surging to record peaks undeterred by a real estate slump in major markets, but they have since gone into free fall and have yet to find the bottom. Market watchers in the former Gulf boomtown differ slightly on the magnitude of the decline so far, but all seem to agree that the prices of Dubai property, which was selling unchecked over the past three years, should drop further. "The decline in prices still has a little bit to go before bottoming out," said Sana Kapadia, vice president of equity research at the regional investment bank EFG-Hermes. "We expect a total drop in Dubai of between 50 to 60 per cent from peak prices in 2008. We have seen a cumulative decline of 45 to 50 per cent so far in Dubai," she said. Consultancy firm Colliers International echoed similar estimates in its quarterly report this month stating that the prices of Dubai housing units had dropped by half by the end of June, compared to peak prices last summer. A report by Landmark Properties last week put the drop in villa and apartment prices in the same period at 44 and 36 per cent respectively. According to a price index set by the real estate brokerage firm, the average sale price for apartments has dropped from around US$405 per sq ft to around US$257 per sq ft (US$1 = RM3.52). Prices are expected to fall further as market liquidity remains tight and costly. Mortgages are scarce, with interest rates between 8.5 and 9 per cent, Landmark Properties said. "Our forecast is that prices will have bottomed out by the end of the year, and should stabilise in the first half of 2010," Kapadia said. This crash has dragged the emirate's economy into contraction after years of breakneck growth, driven mainly by a property sector benefiting from an abundance of cash from a huge regional oil windfall and foreign investments. Economic slowdown has also led to job losses in the emirate, which had become a workforce magnet during boom time, leading to forecasts of a drop in population that would put further pressure on demand and prices. A few areas, however, have seen flickering signs of recovery. Prices in the recently completed upmarket neighbourhoods on the palm-shaped island Palm Jumeirah, which took a severe beating after shooting to record levels, rose slightly in the second quarter as investors with cash appeared to jump on bargains. A report by the property management company, Asteco, last month said the prices of villas and apartments on the Palm have risen respectively by 20 per cent and 7 per cent in the second quarter, compared to the first quarter, when they tumbled up to 65 and 53 per cent respectively from peak levels. Asteco, still however, registered an average drop of 13 and 15 per cent in the average value of villas and apartments in Dubai in the second quarter. "It would be a terrible mistake to believe that we are out of the woods," said Jeremy Mayhew-Sanders, head of investments and development at Sherwoods Property, referring to such few recovery signs. He said that some prices had improved due to an artificial shortage of units on offer in some areas, as low prices had pushed some owners to pull their units from the market. But a shortage of new housing units - a major catalyst for the surge in prices and rents over the past few years - should be the least worry for buyers as thousands of new units are being delivered this year, with more scheduled to be ready next year. Landmark Properties projects some 22,700 residential units to be delivered by the end of this year, with 40,400 others to be delivered in 2010, although many projects have reportedly been put on hold for lack of cash and interest. KUWAIT CITY: Kuwait's largest Islamic bank said yesterday it has signed a US$450 million (US$1 = RM3.52) deal with a US real estate investment trust to buy high income residential real estate in major American major cities. The deal between Kuwait Finance House and Denver, Colorado-based apartment building owner UDR Inc is the second major foreign investment by a rich Gulf nation in the past few days. "The joint venture will seek to acquire high-income residential real estate in major cities in the United States," according to a statement posted on KFH's website. Under the deal signed in London on Friday, KFH's participation is 70 per cent while UDR will shoulder a 30 per cent share, the statement said. The Islamic bank said the joint venture will target class "A" assets with a minimum value of US$20 million that are less than seven years old, and the venture intends to be fully invested over a two-year period. The bank said it was targeting an internal return rate of 12 to 14 per cent annually. Ali al-Ghanem, KFH's international real estate manager, said the partnership with UDR shows the bank was trying to return as a "major player" to the American real estate market, after it had liquidated a large portion of its investments there before the economic crisis began. The statement quoted Tom Toomey, UDR's president and CEO as saying the company was looking forward to investing with its new partner during "these opportunistic times". He said his company owns 50,000 apartment homes around the US, as well as thousands of houses under renovation. The move is the latest in a string of recent investments from Gulf countries into Western property. Student accommodation provider Unite Group on August 12 set up a five-year joint venture with Bahrain's Oasis Capital Bank to develop student housing in London worth an estimated STG194 million (STG1 = RM5.83). An Omani wealth fund in June month bought a 75 per cent stake in London office landmark Bishops Square from Hammerson. Bahrain- and London-listed investment house Investcorp also recently acquired mortgage loans in the US worth US$170.9 million to take advantage of low real estate prices.